New Potatoes Recipes Archives - THE OLIVE BLOGGER - Recipes your family will love! This is honestly my favorite time of year with the fresh local produce starting to come in, and one thing I absolutely MUST have are the little new potatoes. Although they are delicious on their own just boiled and slopped with butter, they are even better when you make them my way; Savory and Herbed with Parmesan Flakes! This potato recipe is so simple and the addition of the herbs and cheese really turn this into an all-star side! You could even substitute these for your boring Thanksgiving mashed potatoes…GULP! Did I seriously just suggest that (I mean mashed potatoes are my second favorite side at a holiday meal!). Yup, these are that good (and that easy) that I am sure everyone will love them! And if we are being honest here, we get too used to tradition, lets change it up a bit! I introduced our families to some new sides last year, including my Kale with Cranberries and Toasted Pecans , and everyone loved it! I can’t wait to do the same this year with these potatoes. As you guessed from the name, you need to use parmesan flakes, not the fake processed white dust you get off the shelf at your local grocery store…just trust me on this, it makes a difference! Also, the key to making this dish successful is how long you actually cook the potatoes for. Be sure to put them whole in the boiling water and cook until a fork goes through easily but doesn’t split them. You want them to have some texture still! Once you have drained them you will cut them into halves or quarters (this depends on the size potato) and gently mash a few partially through. Doing this is what helps to mix the herbs, butter and parmesan together to make a delicious side dish! Place potatoes (whole) into a boiling pot of water and allow to cook until a fork goes through (but not too easily). Gently cut the potatoes into quarters (or halves depending on the size, you want them to be bite sized). 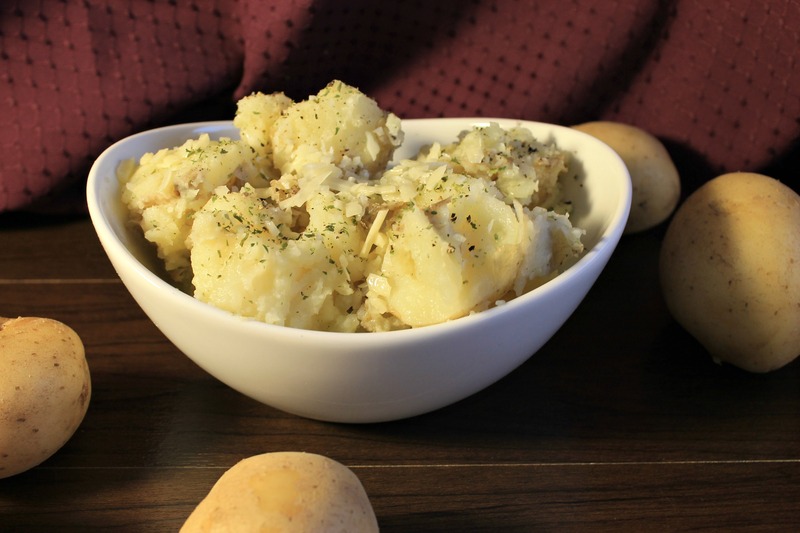 Place them into a medium bowl and gently mash some, not all, to give you a slightly creamy mix of potatoes. Mix butter, garlic and parsley together in a small bowl until creamy and smooth, add to potatoes and stir gently to coat. Mix in half of the Parmesan flakes and sprinkle the rest on top. Serve with your favorite main! This post contains affiliate links, which cost you nothing they simply allow you to get cooking with my favorite tools!